On March 12, 1909, The Arizona Gazette published an article titled, “G. E. Kincaid Reaches Yuma.” It was a short, mildly interesting announcement that Mr. “Kincaid” was only the second person to make the perilous boat trip down the entire course of the Colorado River, starting from Green River, Wyoming and eventually reaching Yuma, Arizona. A feat worthy of mention in the papers of course, but aside from stating that he took over 700 photographs and “Some interesting archaeological discoveries were unearthed,” there was not much indication of the news which was to come next. Twenty four days later, on April 5, 1909, the newspaper ran a follow-up to their first article on the adventurous Mr. Kincaid, except this time it was full, front-page coverage on just what discoveries he’d unearthed previously. This article (also uncredited) reported that along with “G.E. Kinkaid” (his name now spelled with a “k”) a “Professor S.A. Jordan” and a team from the Smithsonian had investigated what appeared to be a large network of tunnels and rooms, some filled with ancient mummies and artifacts that did not appear to be from the Western Hemisphere. And that was the end of the story. No further stories were printed by the newspaper, no knowledge by the Smithsonian about any such expedition, and no one knows if “Kinkaid” or “Jordan” ever existed, let alone the cave itself. That leaves us with two questions: is this story real, and if real, what would be the implications to world history? – “G.E. Kincaid,” Explorer, referring to a cave full of anomalous artifacts he discovered in the Grand Canyon. THE DEVIL IN THE DINER – http://bit.ly/1T0vNNv — An animated short by Peter Sabatino & Zeke O’Donnell and the first video on our newly launched YouTube channel as mentioned in the intro of this episode. Coast Migration/Kelp Highway Theory or Bering Land Bridge Theory? Episode 030 – “Kinkaid’s Cave” Produced by Scott Philbrook & Forrest Burgess; Ryan McCullough Sound Design; Research Assistance by Tess Pfeifle. Copyright Scott Philbrook & Forrest Burgess 2016, All Rights Reserved. 1) Image of the original article in the Arizona Gazette from March 12, 1909, which is the first mention of a “G.E. Kincaid,” his trip down the entire Colorado River, and of a possible discovery of archaeological importance; 2) Image of the 2nd and more thorough front-page article in the Arizona Gazette, dated April 5, 1909, which describes in detail the incredible and potentially history changing discoveries of “G.E. Kinkaid.” Note that with both Arizona Gazette articles, there are no writer’s byline, and that for whatever reason, the spelling of “G.E.’s” name has changed from “Kincaid” with a “c” to “Kinkaid” with a “k.” To this day, these articles are the only known published source references to “G.E. Kinkaid,” his colleague “Professor S.A. Jordan,” or their investigative team from the Smithsonian Institution (referred to in the articles as the “Smithsonian Institute”) or of the 700 photographs, artifacts collected, and the cave location itself. The entire story remains a mystery. 3) A computer rendering by Jack Andrews, copyright ©2000, depicting the deity statue purportedly found by G.E. Kinkaid not far from the entrance to the cave he discovered. 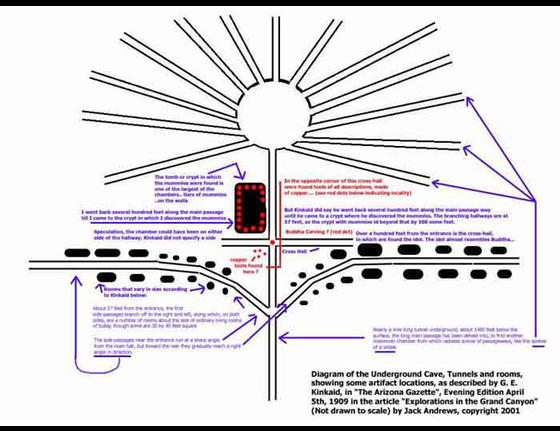 4) A diagram of Kinkaid’s Cave complex layout, as imagined and illustrated by Jack Andrews, ©2001; 5) Isis Temple in the Grand Canyon. Photo from the Strange Conspiracies website: http://www.strangeconspiracies.com/2012/07/conspiracy-of-isis-temple-in-grand.html; 6) The “Tower of Set” in the Grand Canyon, photo from the webpage http://www.crystalinks.com/gc_egyptconnection.html; 7) The “Tower of Ra” in the Grand Canyon, photo from the webpage http://www.crystalinks.com/gc_egyptconnection.html; 8) Zoroaster Temple in the Grand Canyon, photo from the webpage http://www.crystalinks.com/gc_egyptconnection.html; 9) Photo of Stanton’s Cave by Joshua M. on Flickr: https://www.flickr.com/photos/gonzo_fan2007/2397439638. https://creativecommons.org/licenses/by/2.0/ . No changes were made to the image. Stanton’s Cave is often mis-identified in website photos of as Kinkaid’s Cave, of which there are no known photos. Stanton’s Cave is also well known to the National Park Service and visitors alike, and numerous Native American artifacts have been discovered inside. 10) Engraving of infamous hoaxer Joseph Mulhattan (also spelled “Mulhatton” and “Mulholland”). 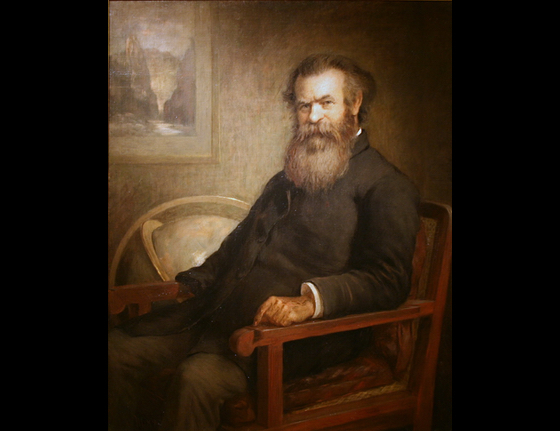 From the hoaxes.org website; 11) Portrait of John Wesley Powell (1889), oil on canvas by Edmund Clarence Messer. Photo by Cliff on Flickr: https://www.flickr.com/photos/nostri-imago/3439636898 . No changes were made to this copy, except that it looks like the gilded frame was cropped at some point. https://creativecommons.org/licenses/by/2.0/ . John Wesley Powell (March 24, 1834 – September 23, 1902) gained fame for his “Powell Geographic Expedition” in 1869 which ran the length of the Green and Colorado Rivers in the United States. This made Powell and his party the first known Europeans to traverse the Grand Canyon. He became the Smithsonian Institution ‘s first director of the Bureau of Ethnology while serving as director of the U.S. Geological Survey.